Costume dramas are by far my favorite genre of TV and film. This likely stems from my love of 18th and 19th Century Literature. I simply cannot get enough of it! Obviously I’m a fiend for Masterpiece Theatre’s “Downton Abbey” and practically plan my entire Sunday around the one-hour show. 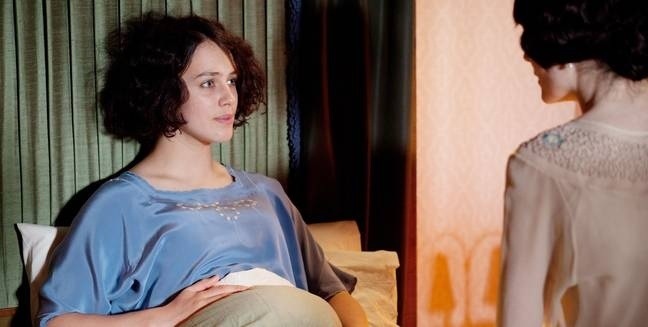 Lady Sybil’s death scene was the most heart- and gut-wrenching I’ve ever seen. I was sobbing so loud and for such a long time, I’m certain my neighbors think I lost a member of my own family. It wouldn’t surprise me to find a casserole on my doorstep after work tonight. To the Downton writers and actors: Y’all. Brought. It. The reactions of astonishment, despair, helplessness and anger by the players amazed me. Dear God, I’m welling up again just writing about it! Jane Austen wouldn’t have so ruthlessly toyed with our emotions. Oh, the humanity of Julian Fellowes! Perhaps it’s rather silly to be so affected by characters in a TV show, but holy wow, if you don’t feel something when you watch that episode, you are dead inside. Dead! A nation of fans grieves today and for who knows how long. Rest in peace sweet, kind Lady Sybil. Crafts, coffee shops and designer Marie Flanigan: It’s a Friday round up! This episode truly was a tour-de-force from this cast. Even though I had been accidentally spoiled about the event, it’s hard not to be moved by those heartbreaking circumstances and performances.